Frequently considered a pesky weed, dandelion (Taraxacum official) is of fantastic value to herbalists throughout the world. Apart from its conventional use to help liver function, the roasted taproot is ground and loved as a coffee substitute. 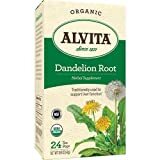 Alvita Dandelion Root Tea is created with premium-top quality, organic dandelion root, and exudes an satisfying roasted and nutty taste and aroma.